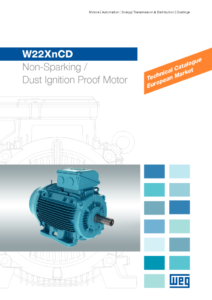 W22X is an evolution on the market of classified area products. 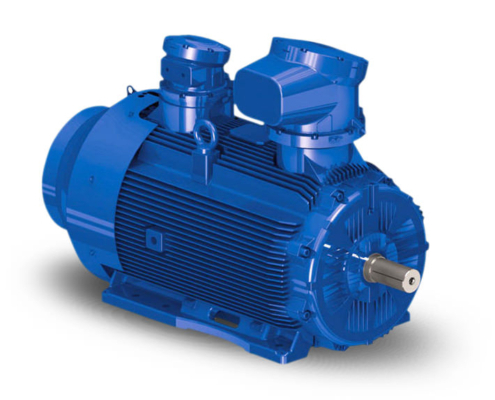 High efficiency up to 330kW. For potentially explosive areas: zones 1, 2 – gas groups IIA, IIB, IIC. 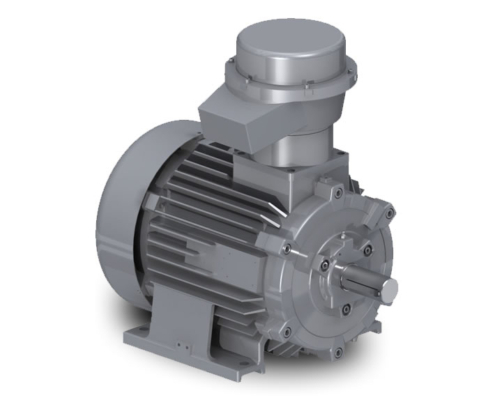 A real answer to the demand of highly efficient products for hazardous areas. 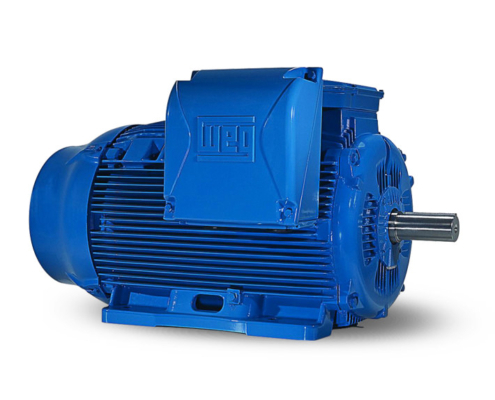 Explosion-Proof electric motors designed to provide top performances. To operate on both Zones 1 and 2, Groups IIA and IIB. Also in versions for gas group IIC on both Zones 1 and 2, Dust environments and Underground Coal Mines. Compliance with IEC standards, NEMA standards, UL CSA, INMETRO ABNT NBR 7094, GOST and certifications from international institutes. 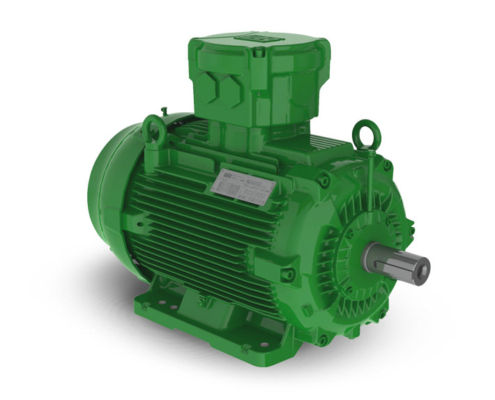 WEG Electric Motors meet IE2 and IE3 standards in agreement with 640/2009/EC. Super Premium Efficiency, IE4, is also available. A complete framework of documents for You. 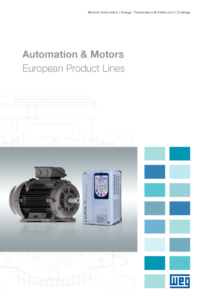 Explore our library of WEG Catalogues, Brochures, Datasheets, Drawings and Curves. Printed on request. 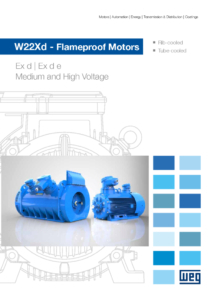 Electric motors suitable for ATEX environments – Zone 2 and 22 – Non-Sparking + Protection by Enclosure on W22 platform. Perfect solution to equipments where fast safety stops are required. 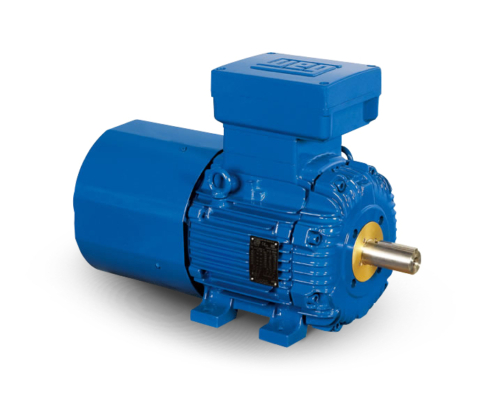 Precise and safe in hazardous areas, such as Zone 1 and Zone 2. 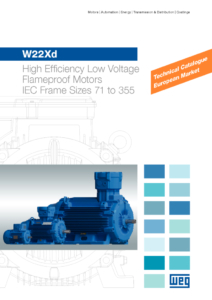 One of WEG flame-proof TEFC three phase motors lines for IIC group of gas and combustible dust. Available for frames 250 up to 315M.